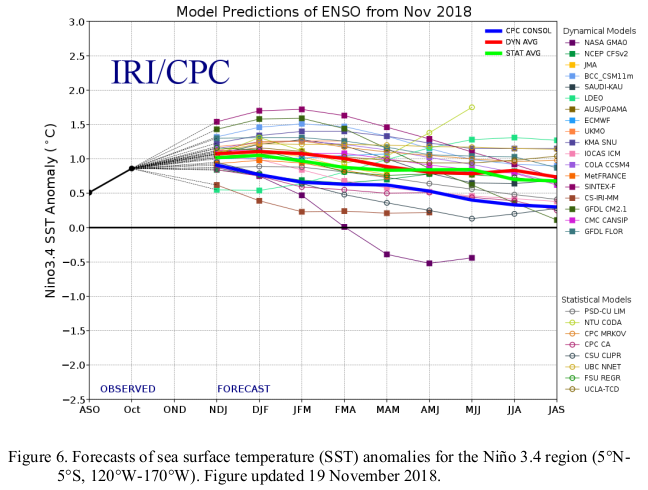 Mid-November 2018 plume of ENSO predictions. Synopsis: El Niño is expected to form and continue through the Northern Hemisphere winter 2018-19 (~90% chance) and through spring (~60% chance). ENSO-neutral continued during November, despite the continuation of above-average sea surface temperatures (SSTs) across the equatorial Pacific Ocean. The latest weekly SST indices for all four Niño regions were near +1.0C. Positive subsurface temperature anomalies (averaged across 180°-100°W) weakened slightly, but above-average temperatures persist at depth across the central and eastern equatorial Pacific Ocean. However, the atmospheric anomalies largely reflected intra-seasonal variability related to the Madden-Julian Oscillation, and have not yet shown a clear coupling to the above-average ocean temperatures. For the month as a whole, atmospheric convection remained close to average near the Date Line and suppressed over Indonesia. Also, the low-level and upper level winds were mostly near average across the equatorial Pacific. The equatorial Southern Oscillation index (SOI) was negative, while the traditional SOI was near zero. Despite the above-average ocean temperatures, the overall coupled ocean-atmosphere system remained ENSO-neutral. The majority of models in the IRI/CPC plume predict a Niño3.4 index of +0.5C or greater to continue through the winter and spring. The official forecast favors the formation of a weak El Niño, with the expectation that the atmospheric circulation will eventually couple to the anomalous equatorial Pacific warmth. In summary, El Niño is expected to form and continue through the Northern Hemisphere winter 2018-19 (~90% chance) and spring (~60% chance; click CPC/IRI consensus forecast for the chance of each outcome for each 3-month period).